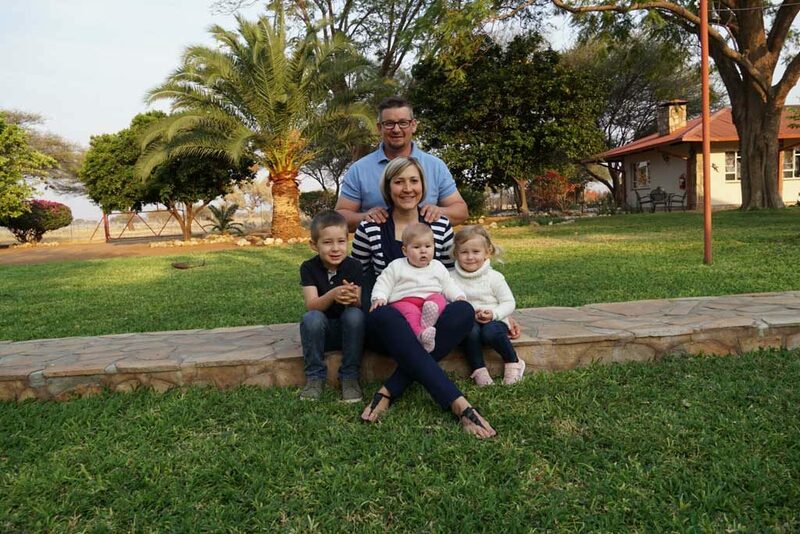 Melanie, Götz and their children Alexander, Tamira und Lea Nederlof are your hosts at the Dornhügel guest farm. For Melanie as a hotel professional each guest is king. Her attention to detail gives Dornhügel its special touch. Even if we have a full house she never loses track of the daily operations and no-one misses out. Her self-made Lemon-, Passionfruit- or Physalis-jams have are famous (check on tripadvisor!). Götz is the man of action on the guestfarm – no stone too heavy, no project too big. Not only at the bar but also during the farm tour the guests can witness his love for the country, its animals and people. Götz was trained as a chef in Germany which is especially beneficial for the guests. Melanie and Götz are supported by a strong team. John is the assistant manager, Stephanus is the cook, who has so far filled every empty belly; Likewise our good-hearted soul Maria. She works together with Katrina and both have a special touch for cleanliness. Götz´ right hand is our San co-worker Lukas, who works wholeheartedly in our oasis garden. He has two young sons who profit from our community project – the Omulunga boarding school for farm children. Irmgard and Max Beyer manage the agriculture and already in the third generation. Irmgard is farmer through and through. When she walks among the livestock her heart leaps. She also supports Melanie at the gest farm – not only with her delicious Granadillas from her garden in Grootfontein. In exchange she receives home-made Lemon-juice. Max loves the people just as much as his livestock and enjoys exchanging his adventures and experiences with the guests. The past and future of Dornhügel are present everywhere – not just the family cemetery is testimony to the intimate connection of the family with this little spot on earth. Irmgard and Max also have a strong team on the farm. The foreman Jakob, the deaf-mute Hendrik, as well as Thomas, Dawid and Johannes our Owambos, Elvis as representative for the San as well as Gerhard, Petrus and Andreas who come from the Okavango strip, are part of their team. 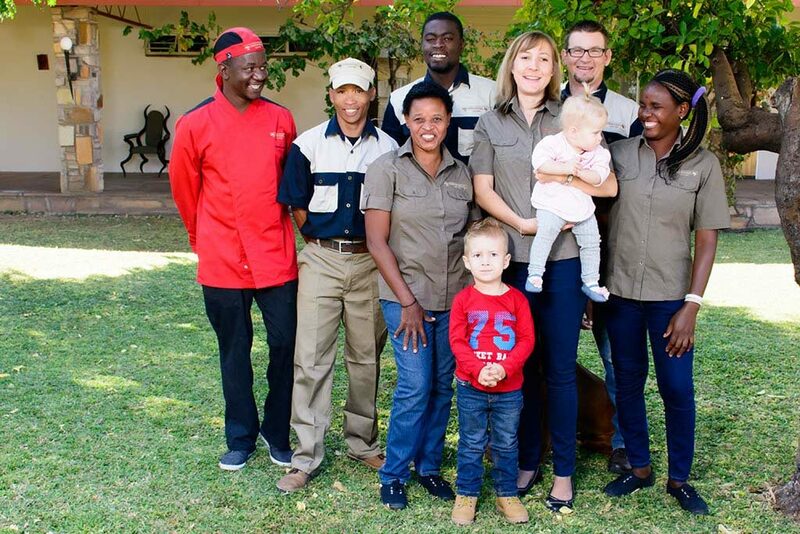 Dornhügel is one of the last unique Namibian farms with homely atmosphere, stylish ambience and proper facilities. It is very conveniently located for day trips to the Etosha national park as well as several other attractions in Namibia. Unsere komfortable Lodge für unvergessliche Urlaubsmomente bei einem Ausritt, einem Scenic-Drive über das sehr weitläufige Farmland oder einer Wanderung in die umliegenden Berge. Die ETUSIS LODGE und Reitbetrieb liegt auf halber Strecke zwischen Windhoek und Swakopmund. Nur wenige Meter trennen unsere Wohnung am Nordstrandpark in Swakopmund vom Meer. Für eine bessere Nutzung verwenden wir Cookies auf unserer Webseite. Um mehr zu erfahren klicken Sie hier.